(update 2 Oct 2012: Corrected typo) Well, I’m running a little later than planned, mainly because of crawling out from under tons of unread email, a huge accumulation of stuff in my in-basket at work, and general catching up after being on a very slow and restricted internet connection for 5 days. 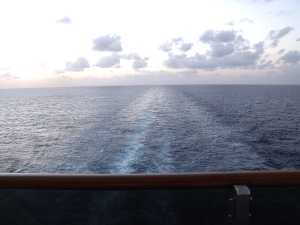 That last part is probably the most painful part of being on a cruise for me. I would dearly love to have the same unlimited high-speed internet service on a cruise as I have at home, but I’m guessing that I would end up spending too much time online when I really should be doing more productive things like conversion of cholesterol into vitamin D3 (that’s geek for “lying out in the sun”). The other extreme, no internet access at all, might actually be better. That could actually be relaxing, although I haven’t had the motivation to completely cut myself off for any substantial period of time to see if that would be the result. The in-between zone is probably worst of all. At 50 cents a minute, and veeeeeerrrrrrrrrrrry excruciatingly sllllloooooooooooowww internet, every minute spent online is an exercise in frustration. Especially since the connection itself is so flaky that there were some things I just could not do at all, like uploading and linking the photographs that I took. I had to update the last post with photos after I got home to reliable high-speed internet. I had several plans for things I was going to accomplish online, but I simply gave up on most of them. 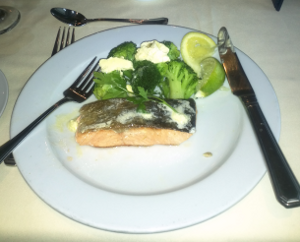 Supper: Baked Salmon Entree with Buttered Broccoli — YUM! I had the best of intentions! I was going to take a picture of every meal that I ate, and I was going to be ultra-clean with my diet, following the general guidelines of avoiding gluten, starch, sweeteners of any kind, and eating fish at least once a day. I ended up missing photos of about 1/3rd of my meals just because I wasn’t in the habit. I ended up eating some thickened soups that I strongly suspect had wheat flour added. I even ate some things with some sugar added. About the only successes I had were that I did indeed eat some fish every day, and I did manage to restrict myself to only one entree at all of the dining-room meals, and we did do dining-room meals whenever they were available (lunch was not available in the dining room on port days, so we did use the buffets on port days). However, we also visited the buffets for extra meals during the day, and I generally had either four or five meals every day. Plus several cups of decaf coffee with half-n-half. Since I wasn’t weighing an measuring anything, I don’t really have a very good idea of calories, or even macro-nutrient ratios, but I think I probably hit somewhere in the neighborhood of 50 to 75 grams of carb most days, and nearly 250 grams of protein, and enough fat (butter, cream, half-and-half, eggs, oily fish, sausage, and bacon) to push the daily calorie count somewhere north of 3000. 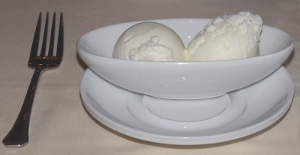 Sugar-Free Ice Cream for dessert Wednesday night. Nothing sweetened, either with sugar or artificial sweeteners. Fail. I had some chocolate candy in Cozumel, and sugar-free ice cream for dinner the last night. I also had a generous bite of Georgene’s “Chocolate Melting Cake” and a sip of her “Chocolate Martini.” I also had a slice of banana dipped in the chocolate fountain on “Chocolate Buffet Day” (Wednesday). At least one serving of fish every day. Succeeded! Only one entree for supper. Succeeded! I might try more than one appetizer, but I’ve found that all of the thickened soups have added wheat flour, which I avoid in general. 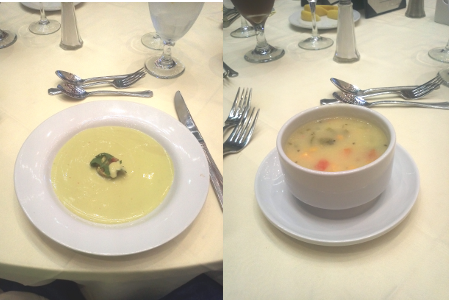 Fail.While I was able to limit myself to just one supper entree, I had the avocado soup, and the Caribbean Pepper Pot soup, both of which tasted like they contained wheat flour. Avocado Soup and Caribbean Pepper Pot, both thickened with wheat flour. At least 4 pats of butter every day. Succeeded! That was pretty easy. Moderate protein (less than 250g for sure!). Partial Success. I think I kept it between 200 and 250g. I did manage to spend some time lying out in the sun. And I spent a lot of time reading, both a dead-tree book on photography I brought with me (as you can probably tell, I need to study that one some more!) and several e-books on my Android Kindle app. Oh, yes, I lost 1.5 lbs during the cruise. Since that’s actually (barely) within my normal daily fluctuation, I checked again this morning, and I was still at 236.5, so I think I can legitimately count that as a loss. Losing while cruising! What a concept! This entry was posted in Diet, Health, Low Carb Cruising!, Nutritional Research and tagged carbs, cruising, eating clean, excessive protein, gluten, meals, online, photographs. Bookmark the permalink.